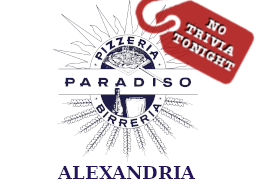 There will be no trivia tonight (11.20) at Pizzeria Paradiso (Alexandria). There will still be trivia at Pizzeria Paradiso (Hyattsville). Be sure to check our Facebook and Twitter, and Instagram for updates and relevant trivia news! You can also check out the We Don't Know Either podcast to get your trivia fix and learn some interesting facts. We'll be back at Pizzeria Paradiso (Alexandria) next week!